All the things we do -- eating, walking, washing, working, talking -- everything can become very powerful methods for quickly achieving enlightenment. As we purify ourselves and collect extensive merit, we bring ourselves closer to enlightenment every minute of every day. In this way, we make our lives most beneficial, meaningful, satisfying and fulfilling. Through the Mahayana practice of offering the food we eat which is based on the Hinayana and adorned with the Vajrayana our lives become most beneficial, not only for ourselves but for all sentient beings. This is a short practice, made to be easily accomplished wherever you go. 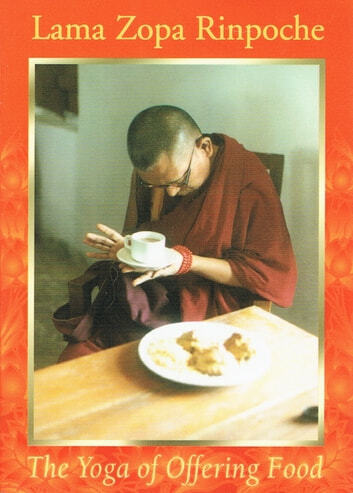 This title was published by the Lama Yeshe Wisdom Archive, a non-profit organization established to make the Buddhist teachings of Lama Yeshe and Lama Zopa Rinpoche freely accessible in many ways, including on our website for instant reading, listening or downloading, and as printed and electronic books. Our website offers immediate access to thousands of pages of teachings and hundreds of audio recordings by some of the greatest lamas of our time. Our photo gallery and our ever-popular books are also freely accessible there. You can find out more about becoming a supporter of the Archive and see all we have to offer by visiting the Lama Yeshe Wisdom Archive website.